They are called intrusive thoughts—disruptive fantasies of anger, hate, and most of all, fear. In psychology, intrusive thoughts are negative ideas that’re automatic, frequent, upsetting or distressing, and difficult to control or get rid of. They are associated with obsessive-compulsive disorders and depression, but they can be experienced by all of us. And now, this guy illustrates them. Los Angeles-based artist Fran Krause is an animator. He is currently faculty in the Character Animation Program at CalArts, creator of several cartoons, and he’s the guy who draws the Deep Dark Fears web comic series. Deep Dark Fears is a Tumblr blog where fans can submit their darkest intrusive thoughts and Fran Krause would illustrate them. It started with Krause’s own phobias. 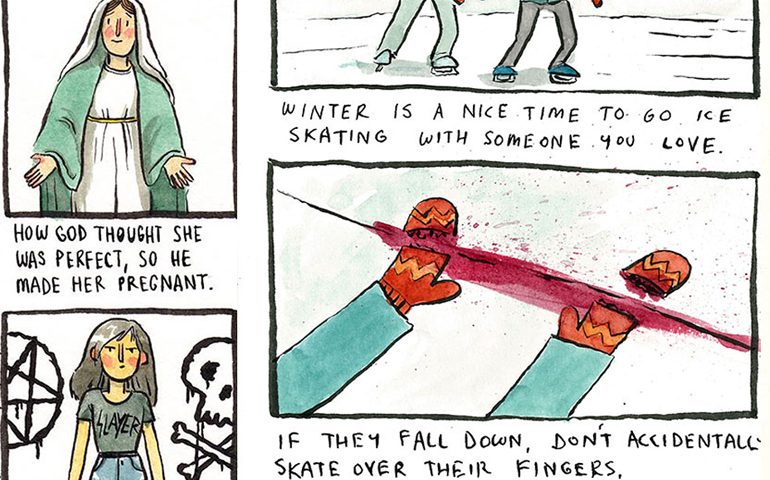 Now, there are hundreds of short comics featuring irrational fears and intrusive thoughts that readers sent him. It’s quite amazing how common some fear-inducing thoughts are. If you have an intrusive thought and brave enough for it to be illustrated, submit it to http://deep-dark-fears.tumblr.com/submit.